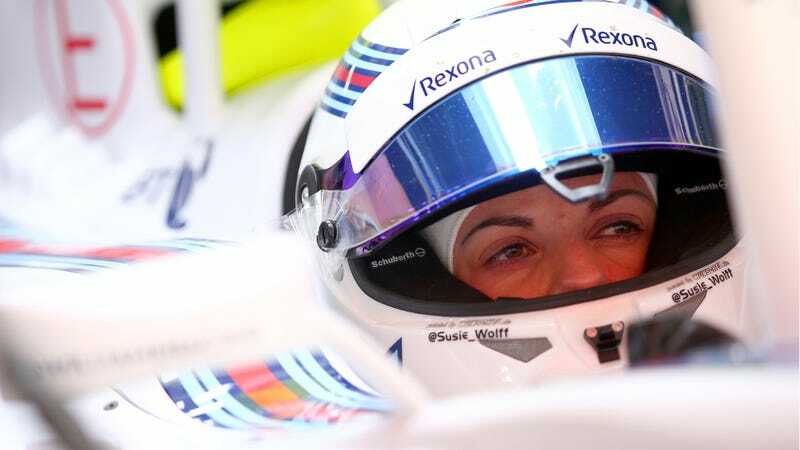 According to Autoweek, Williams Martini Racing test driver Susie Wolff expressed some hum-hawing about her future with the team at Barcelona. She was disappointed when Adrian Sutil was brought in as the reserve driver, and feels as if her chances for seat time look all that much slimmer nowadays. Sutil was brought in after driver Valtteri Bottas suffered a back injury at the Australian Grand Prix. Williams didn’t field a car to race in Australia because they hadn’t given Wolff any seat time during the practice sessions, and they had no other reserve or test driver who had. That was all F1’s doing, not so much Williams’, though. With the limited time for testing, though, test and reserve drivers get precious little seat time as it is. What was Williams’ doing was hiring Adrian Sutil as a reserve driver, one step ahead of Wolff in terms of filling in for a race. Williams didn’t have one before, and everyone assumed up until the Malaysian Grand Prix that Wolff would be the first back-up in case of a weekend where a driver can’t participate. Most teams have multiple test and reserve drivers, so Sutil’s hiring makes sense. Sutil is a solid driver without a ride for 2015, as he was the other fellow on the outs when Sauber over-booked their roster. For Wolff, though, it means she has one more obstacle when it comes to getting into a race seat. She made an appearance during Friday practice at this weekend’s Spanish Grand Prix, and will get to drive again during practice for the British Grand Prix at Silverstone in July. That’s a pretty lengthy break, though, and Wolff is now saying that she will see “where that brings me” after her drive in July, according to Autoweek. I am not someone who lets my head get down. I am completely realistic. If I did not think I was capable of racing at this level, I would be the first to take myself out of the game. I 100 percent believe a woman can compete at this level. In the same respect, I’ve always said that if I cannot make progress and I cannot improve, I would be the first one to hang up my helmet. I’m not going to keep pushing hard if I don’t see any opportunities. Could the lack of in-car time (and thus, opportunity to get seat time and exposure) be the issue that drives Wolff to look for other opportunities? That’s what some believe. Formula One has limited testing so much that being a test driver may be a prestigious achievement, but doesn’t exactly get you a ton of time in the car itself. If Wolff wants to drive, she may have more success going for a seat in another series in the meantime in addition to or instead of the Williams test role. Update: Something else worth noting is that Wolff currently doesn’t have the superlicense required to compete in F1 (and didn’t in Australia, either. ), but she also doesn’t see the point in getting one just yet. Her comments to the BBC about her situation were even more biting.